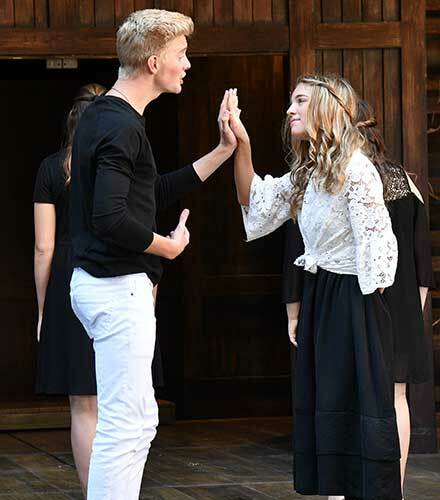 Cedar City, UT – This weekend the 42nd annual Shakespeare Competition, hosted by the Utah Shakespeare Festival and Southern Utah University, gave out dozens of awards and scholarships to drama, dance and music students. The competition is the largest scholastic Shakespeare competition in the country, and this was a record-breaking year with nearly 3,600 students from 123 schools in seven states and the U. S. Virgin Islands. From September 27 to 29, students competed before numerous adjudicators on the Festival’s stages and at many other venues on the SUU campus. Judges consisted of arts professionals with strong literary and performance backgrounds. The judges came to Cedar City from across the country, including California, Maryland, Alabama, and New York, and not only judged the competition, but provided critiques of performances and gave feedback to the young artists. Judges also offered numerous workshops on topics such as stage combat, improvisation, movement, technical theatre, auditioning, ballet, modern dance techniques, and choral performance. As part of the total experience, students were able to attend the Festival’s productions of The Liar, Othello, The Foreigner and An Iliad, as well as an SUU production of Richard III. The competition was divided into six divisions: Buckingham (large public high schools), Oxford (midsize public high schools), Cambridge (small public high schools), Westminster (charter schools), Stratford (junior high and middle schools) and Essex (schools or groups which are not members of state high school associations). Barbara Barrett Award: Given to juniors and under, this award is a $500 scholarship to the Festival’s summer acting intensive Actor Training, or a tuition scholarship to Shakespeare for Junior Actor Training. The dance scholarships to Southern Utah University were awarded to Anika Grimes, Corner Canyon High School, Draper, Utah; and Darcie Miles, Timpanogos High School, Orem, Utah. The music competition encouraged students to explore and develop a relationship with the music of the Renaissance (music prior to 1650). Students were encouraged to utilize creative combinations of instruments; however, no instrumentation was required. For the music competition, students were able to compete in Madrigals and Minstrels. Madrigals (a minimum of five people) presented six- to ten-minutes of Renaissance music. Minstrels (one to four people) presented three- to seven-minutes of Renaissance music. Schools in the music competition were divided into two divisions, according to size: large and small. The final competition was in the technical theatre area for students who work behind the scenes creating sound, lighting, props, scenery, and costumes. In the portfolio area, students were given the chance to have their technical and/or design portfolios evaluated by professionals in technical theatre. Technical theatre students were able to compete in Tech Olympics, with winners named in costumes, lighting, make-up, props, rigging, set construction, sound, and stage management. Overall school winners were also named. The best portfolio and runners-up were also recognized.